Cheap flights from Paris to Taipei, Taiwan from €307 return! Lonely Planet promotion code 2019 – up to 45% discount! Cheap (non-stop) flights from London to various cities in Mexico from £369! Looking for a budget solution from France to Taiwan consider current promotion of Air China. (Member of Star Alliance). Based on this carrier you can book cheap return flights from Paris to Taipei already for €307 incl. all taxes and checked bag. Good availability especially in spring 2019. Flights have one layover either in Shanghai or Chengdu on your way to Taiwan..
Disocunt with Air China is available for flights departing from Paris to Taipei from 3rd of February to 20th of of June 2019. Max stay 3 months. Book this promotion by 20th of January or until the cheapest seats last..Need some accommodation in Taipei we recommend service of Booking.com or Hotels.com. Below you will find our booking as well as few travel date samples. 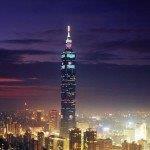 Booking sample of cheap flights from Paris to Taipei, Taiwan from €307 return! In this case your outoubound flight would be on Sunday, 12th of May. Inbound flight from Asia back to France then on 26th of May 2019.